In this issue of WHOTT Web News we take a brief at Railway Bus Services and Just the Ticket 19. 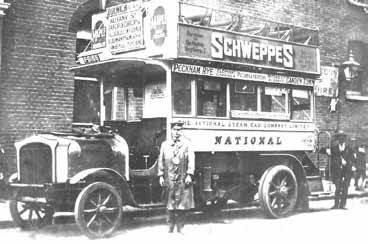 Railway Bus Services - Part 1 – the background In 1928 an important piece of legislation was introduced that enabled railway companies to take a substantial stake in bus companies. The impact that this could have on the way bus companies were run was met with cautious optimism. It meant that as many as half of the bus company board of directors could be railway men, something that had been unheard of before. Here in the south west, the Great Western Railway had, themselves, been operators of bus services from an early date and were not, therefore, ignorant to the business of providing road facilities as well as rail. The co-operation of bus companies in association with railway interests had to be encouraged, so in the spirit of the Act, history was in the making and soon buses appeared with new names and timetables reflected a desire to strengthen passenger service connections. This article attempts to explain the history and background to events that led to the following letter being written to the General Manager of the Great Western Railway. which will give both a fair chance. This letter from Sir John Jarvis (Chairman of the National Omnibus & Transport Co) to Sir Felix Pole clearly sums up the aspirations of one individual who, with stolid determination, played the railway company at their own game. The Railways’ Road Transport Bill had, only weeks before, been moving through Parliament and Jarvis was anxious to commence talks with the GWR, even before the Bill had been passed. The railway company had been consistently building up a sizeable portfolio of bus services throughout its territory. From 1919, when they possessed just 38 services, of which as many as 26 operated in Devon and Cornwall alone, to 1927, by which time it had increased to 191, of which the two counties enjoyed 72 GWR omnibus routes. When one recalls that by 1928 the Great Western controlled 168 bus services over its territory, using 300 vehicles and carrying over 8 million passengers annually, all without specific powers to do so, how remarkable an achievement it was. With so many rail and road connections available it was a most complicated task to dovetail the workings of the two together, yet this they managed to do with some measure of success. In bringing about the fusion of the Great Western Railway’s bus services with those of the National Omnibus & Transport Company in the Westcountry we must turn the pages back and take a look at the way each player came into the ring. The National company was registered in 1920 to take over the business formerly carried on by the National Steam Car Company Ltd. 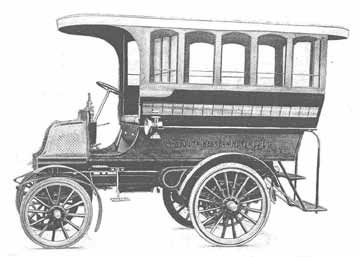 The steam car company had itself been founded in 1909 to promote the use of steam omnibuses, particularly in London, though its founder and creator, Thomas Clarkson, was based at Chelmsford, Essex in which district he had already tried to make an impression. It was in that town that the steam buses were built, but it was not until 1913 that operations with his vehicles really took off in that area when the company acquired the bus services operated by the Great Eastern Railway. In London, however, Clarkson enjoyed success. The steam bus was quieter and smoother running than its petrol counterpart and by 1914 he had over 170 of them working principally on four routes between Stoke Newington and Putney, Shepherd’s Bush and Dulwich, Peckham and Camden, and Putney and Liverpool Street Station. Following an agreement with the London General Omnibus Company in 1919, the National surrendered its London services to them in exchange for the General’s services in the Bedfordshire area which lay outside their newly defined boundary. This move coincided with the National’s own policy to scrap its steam operations in favour of petrol driven buses which now provided the scope for expansion into the provinces. Soon after Clarkson, who had been involved with steam developments and patents since 1895, severed his connection with the company and went on to apply his ideas elsewhere. Very typical of the Clarkson steam bus that operated in large numbers on the streets of London by the original National Steam Car Company. Pictured at what is believed to be The Britannia, Camden Town terminus is car 97 (F6166) with standard Hurst Nelson body before the windows to the side of the drivers cab were removed in 1914 on the instructions of the Metropolitan Police. Exactly where the South West Motor Co Ltd operated is a mystery, but it is likely to have been somewhere in Devon or Cornwall. This little bus is a ‘Granville’, built by the MMC of Coventry and commenced running early in 1901. Powered by a 6hp double-cylinder English Panhard engine, the accommodation offered seats for eleven passengers, three of whom sat next to the driver. The MMC now enjoys a proper steering wheel. The body was of contrasting teak and sycamore woods and the windows were made of a substance called xylonite. Just the ticket 19 - Illustrated left are the fronts and backs of two so called universal tickets printed by Williamson which were taken into use early in the last war. They were called universals as they could either be used as singles or returns and there was no longer a need to issue an exchange ticket for a return. The aim was to save paper and to this end it will be seen that the fare box has been cut into by the cancellation section with the intention of reducing the overall length which even then totals 127mm. The company title and reference to association with the main line railways is the same as before. Due to wartime restrictions only two colours are now used, namely white for uneven values and green for even ones. Close examination shows that the layout on both tickets is the same although the stub has been removed from Of 3100. It may not be generally known that C.D. Ex immediately above Stage 1 stands for Cheap Day Excursion which was a hangover from before the war and would not have been usually available. 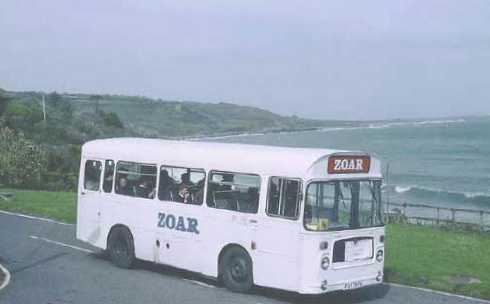 Former Western National LHS, FDV787V, belonging to Zoar Coaches waits at Coverack before heading on to Mullion in May 2002.